Last Friday, Josie and Lily and I headed to the ice for one last gorgeous day of ice skating. The sun was shining, the ice was smooth, and we skated and played for hours. We had the entire lake to ourselves. It was such a special time for us to spend together and it was truly a magical day. 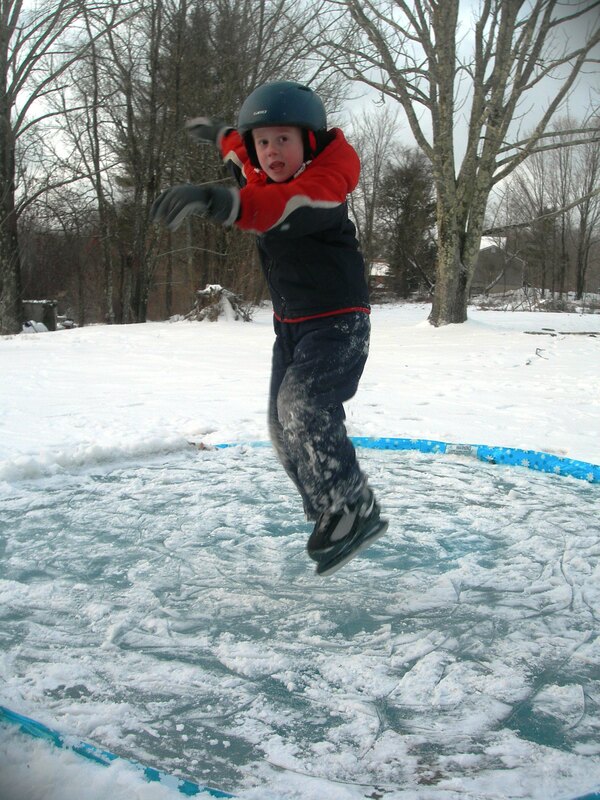 Finn really likes to work on jumping when skating on our little rink. Well, it was only a matter of time before Josette joined in…. I am terribly behind in my posts. These photos are from a little while ago when Josie wanted to give cross country skiing a try. She did great. We went through the back woods quite a ways and she is keen to go again. I realized I haven’t posted any of our grand ice fishing adventures yet. And, whew, there have been several since the pond froze. It becomes a weekly activity this time of year. The guys drill the holes and set up the traps. There is skating and sledding and then you hear the yell, “FLAG!”, and everyone goes racing out to the trap to pull the fish. Then, it is back to the ice shenanigans or stopping for some cocoa or hot dogs by the fire, and then “FLAG!” and the race begins again. It is just about the best way to spend a Saturday in January in NH! Finn’s school has a wonderful art program. I remember being very impressed the when I got a tour of the art studios. After Christmas, Finn was very excited to bring home a sample of his portfolio to date. Included was a lovely letter outlining the teaching philosophy in the art studio that reinforced my initial impressions. I loved looking through the art that Finn brought home. It seems to include a lot of pictures of home and family as well as some wonderful dreams of rockets, and pirates and rainbows in the sky. Well, after just a few days of practicing ice skating, Finn decided he needed to take it to the next level and start catching air. And, he just keeps landing on his feet! We have been anxiously looking at weather reports and hoping for a frozen lake for skating this year. After a cold week last week, there was a projection for a storm with snow and ice and rain which would likely ruin the gorgeous flat ice. So, on Saturday before the storm we ever so hopefully made our way to the lake in hopes that the ice had thickened enough for some skating. As it turns out we were in some luck that day. And realizing this was an ephemeral situation, we took to the ice with gusto and stayed skating as long as our legs would support us. There is truly something magical about having a huge expanse of ice in front of you to glide across. You feel so effortless and free to move. The ice was black and you could see through it to the water plants below. If you recall last year, Finn refused to give skating a try. I tell you, this kid was just waiting until he knew he could walk right out on the ice and skate away as if he had been doing it for years. Josie is still sporting the double blades, which gives her a good level of independence. She scooted along with Grace, when they weren’t coaxing everyone into tugging them along in sleds. Alas, the snow has come and we aren’t sure it there will be more lake skating this season, but this one day was wonderful.